HUDSON, N.Y. – Members and advisors of the Psychology Club and the Criminal Justice Club at Columbia-Greene Community College spread holiday cheer to members of law enforcement across both counties this season. 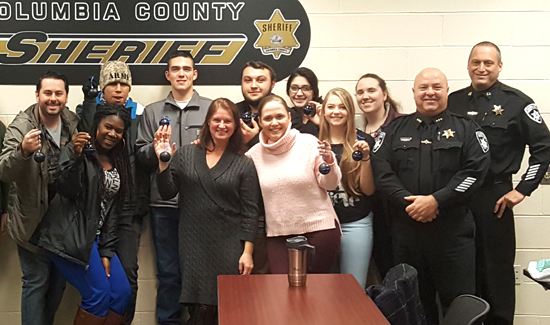 Promoting the Back the Blue Campaign, a national effort that seeks to recognize the efforts and sacrifices of law enforcement officials, the C-GCC student organizations decorated and delivered holiday ornaments to every sworn member of the Sheriff’s office this month. 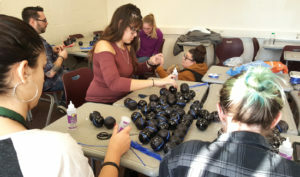 According to Barbara Shaffer, associate professor of Psychology and Sociology at C-GCC and Psychology Club advisor, more than four hundred ‘Thin Blue Line ornaments’ were made with the goal of recognizing every officer, whether full-time or part-time, within Columbia and Greene counties. In a long line of deliveries across the two counties, ornaments were disseminated along with special treats for the K-9s members of the teams. The Psychology Club and Criminal Justice Club are just two of 14 official student organizations at C-GCC, which also offers 37 academic programs. For more information, visit SUNYcgcc.edu, or call 518.828.4181.